Let me start by saying I strongly recommend professional instruction and reading. Try Stand Up Paddling: Flatwater to Surf and Rivers by Rob Casey and Stand Up Paddle: a Paddlers Guide by Steve West. Here are 5 things you should think about. Respect it, but do not fear it. Research the stretch you want to paddle. Paddle with friends. Have a good understanding of what class I-V whitewater is. Run a shuttle and leave dry clothes, water and snacks for the takeout. Hitchhiking hungry and wet is miserable. Have the right equipment. Which brings me to my next point. Use a board designed to perform in, and handle the abuse of whitewater. Choose a paddle with a durable blade and hold it with the angle pointing the blade away from you. You’ll avoid one of the most common rookie mistakes. Understand Coast Guard ratings for life vests, you’ll need a type 3 or 5 for the river. Wear a helmet. Even in slow moving water you could lose balance and bump your head on a rock. Wear shoes! There are plenty of things to cut your feet, protect them and you’ll have a better day. Which brings me to my next point. “Rig to flip” might be the most well-known piece of river advice, but I put it to you that “Dress to swim” comes in a close second. It may be 70-80 degrees out, but wet = cold. Wetsuits are reasonably priced, pretty durable and can go a long way towards keeping you warm. Generally, layers that work for skiing will keep you warm even if they are wet. Cotton feels great at the takeout, but has no place on the river. Even if you don’t fall in, it could start pouring rain. Which brings me to my next point. It sounds simple, but I can’t tell you how many times I’ve headed into what was forecasted to be a beautiful paddle and been poured on. Or vice versa. A late or early season paddle can turn from 70 degrees and sunny to 50 degrees and raining quickly. A rainstorm in the high country in early May might actually mean you end up paddling in the snow. On a 90 degree day you may want to cover up, nothing wears you out and dehydrates you quite like too much sun. Which brings me to my next point. Keep yourself hydrated and fed. Before and after, if not during, a paddle session. Listen to your body. Sit down on the board and chill for a while if your legs are getting tired. If a rapid looks too much for you, walk around it or run it on your knees. If bad swim has you spooked, tell your friends, you’ll feel better and they can help you. Don’t push yourself so hard that you become a liability. Relax. This is all good advice, but it’s not all the advice. There’s no substitute for instruction and personal experience. 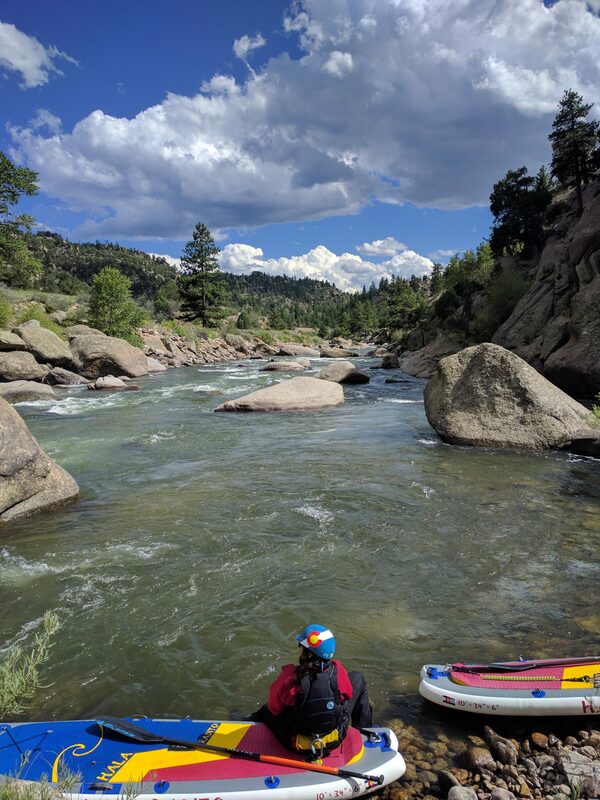 River paddling is a marathon, not a sprint. Take your time. Paddle for the rest of your life.